Our company is involved in the manufacture, export and supply of a wide range of Mechanically Actuated Diaphragm Horizontal Type Pumps that are highly demanded by the clients for precise engineering and durability. Post-procurements, these diaphragm pumps are quality tested on various parameters of quality by our expert professionals. Offered diaphragm pumps are developed by our skilled professionals utilizing supreme class material as per the technological advancements. With the assistance of our team of professionals, we are engaged in manufacturing, exporting and supplying a wide range of Mechanically Actuated Diaphragm Vertical Type Pumps. 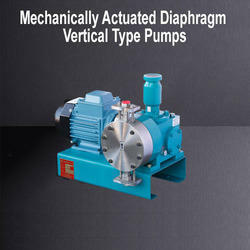 These diaphragm pumps are widely praised for its various special features and superb performance. Suitable to handle most destructive liquids, our diaphragm pumps are checked on varied parameters so as to deliver a fault free range. Offered diaphragm pumps are accessible from us on numerous specifications to meet the demand of customers in a committed time frame. 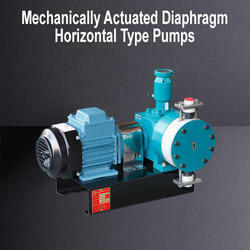 Looking for Mechanically Diaphragm Pumps ?